I know most of you just want to skip forward and see my photos of the Taj Mahal. Don’t worry, they’ll come in due time. But first, I’m gonna tell the story of how we got to Agra, the city of The Taj. My last post was about our foodie tour of Old Delhi, called “On the Old Delhi Food Trail”. That, not coincidentally, is also the name of Beth’s blog article about the same tour, and I encourage you to go check it out because it’s probably better than mine. We spent another couple days in Delhi after that, but didn’t do any more interesting sightseeing. We spent our time planning out the next step of our journey and taking care of other real world stuff. The next step of the journey was going to be to the city of Agra. That’s the second corner of what they call the “Golden Triangle” of northern India. The three points of the triangle are Delhi, Agra, and Jaipur, and we would eventually visit all three. After some research, I set up a place for us to stay in Agra at an Airbnb property. It was a true homestay, unlike some places listed with Airbnb that call themselves “B&B” or “homestay” but are really just somebody’s spare house outfitted to rent out every bedroom to guests (what I call an Airbnb Flophouse). I’m going to write more about Sri Radha Krishna Kunj Homestay later. But how to get to Agra? It turns out that one of the services our huge expensive hotel in New Delhi offered was a travel desk. I had wanted to take a train, but due to the weirdest bureaucratic restrictions you can imagine, I was unable to search for or book rail tickets, because I didn’t have a mobile phone with an Indian number. So I went to the travel desk for help. But alas, the travel desk guy couldn’t. He got to a certain point in the process where he found that the bus reservation website also required a working mobile phone with Indian number. And obviously we couldn’t use his, and I didn’t have one. I had hoped and assumed he’d dealt with this problem before, since most of his guests are foreigners. But he hadn’t. I pressed him. “Well, how are you going to make this work?” He punted and just said I’m going to have to book it myself. Thanks for the non-help, dude. Eventually I figured out the magical incantations to the web gods to get an account working on a 3rd party bus scheduling website, and reserved two seats on a “Volvo 45” bus, the best and most expensive kind. It really did only cost $18 for both of us to get there by bus. That’s a little more than the train would’ve cost, but oh well. It’s a lot less than the $120 car that the travel desk tried to convince me to take. I printed out the e-tickets for the bus at the “business center” which took about 20 seconds, since I did it myself rather than waiting for some nearly-incompetent hotel employee to do it. On the way out I asked if I needed to pay anything, and they said normally it’s 50 rupees a page, but they will waive the fee today as a courtesy. 50 rupees is like 75 cents US. 75 cents per page to print a document? Seriously? That gives you an idea of how eager this hotel was to nickel-and-dime us. Since we were staying in the $400 a night suite (remember, we didn’t actually pay anything for the room but were burning frequent flyer miles for it), one benefit we were supposed to have was complimentary transfers from and to the airport. Since we had already arrived from the airport and paid for that ride, we couldn’t use that benefit. So I asked someone at the front desk if we could use our complimentary hotel transfer to instead get a free ride to the bus station. She said that shouldn’t be a problem, but when we check out, come see her specifically, because the other front desk clerks wouldn’t allow such a thing. So when the time came, we checked out, went to see her, and set up a ride to the “interstate bus terminal”. Our driver, unfortunately, had never been there. It seemed like we were the first guests of this hotel ever to want to take the bus, so he had never driven anybody there. And having no need to take an interstate bus himself, he didn’t know where the terminal was. He got rough directions from someone and we were off. But he took a wrong turn at some point, and drove us into a street that must be the worst traffic we have seen in Asia so far. I don’t know what happened, but the exits from this street were totally blocked, and so everyone who was driving into the street was trying to do a U-turn to get back out of the dead end. It was a total mess. I think we were stuck in that street at a dead stop for 30 minutes before the one forward-thinking local with leadership skills took it on himself to start unsticking the traffic. Until that, it was just a thousand cars, motorcycles, and tuk-tuks all honking pointlessly at each other, and another thousand pedestrians, bicycles, and rickshaws trying to squeeze through the cracks. It took some work and some yelling and a few ungrateful hand signals, but Action Man finally did get traffic all turned around and moving. Give that guy a gold star, I say. Once we got out, our driver turned down an alleyway that led into the bus terminal area. This wasn’t like bus terminals we’d seen in other countries, a big building with a waiting room and several lanes for buses to flow through, with signs to tell you where to catch your bus kinda like a train station. This was just a one acre dirt patch surrounded by slums with about a hundred places for buses to park, and all signs in Hindi only. I have no idea how you’re supposed to find your bus, but our car driver took pity on us and carried our luggage and asked a bunch of questions and eventually found that our bus will leave from bay 72. So once we found it, he felt like he had discharged his duties, and I tipped him extremely well, and Beth and I sat down on a bench to wait. The bus came on time, we paid the driver 10 rupees per bag to stow our luggage underneath, and we got on board. The bus wasn’t nearly as clean or beautiful as the photos I’d seen, but it was a big step up from the non-luxury buses. The drive to Agra took about three and a half hours, with a 20 minute stop for bathroom, tea, and snacks. And that’s how we got to Agra. Where is Agra? Remember, I said it’s one of the cities of the Golden Triangle, and it’s south of Delhi. And it’s where the most recognizable symbol of India is, the Taj Mahal. In the winter, the smoke and other pollution in northern India combines with cool nighttime temperatures to create smog. 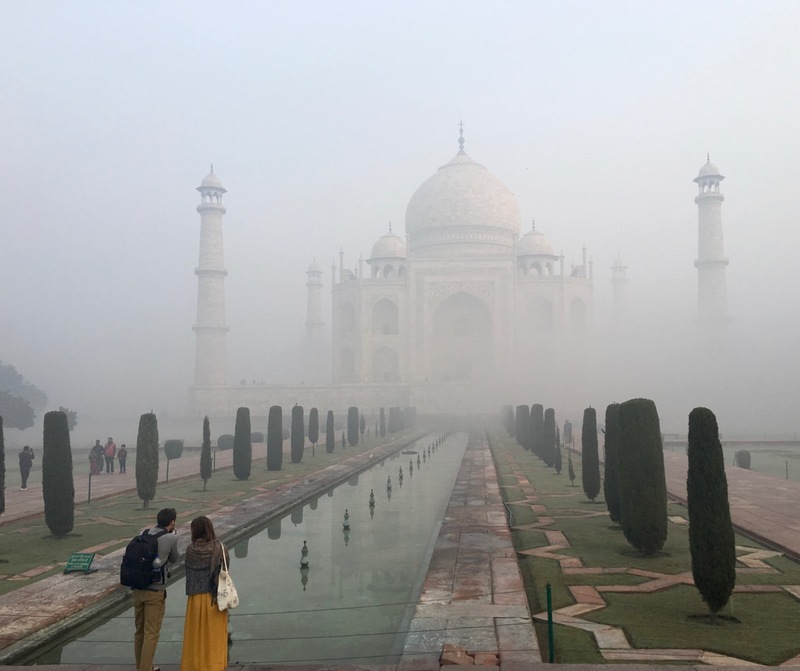 Here is a shot of the Taj Mahal, India’s most famous landmark, on a December morning as the smog lifts. I love all the stuff about getting to Agra. It was quite the adventure, and I think it’s useful information for readers.